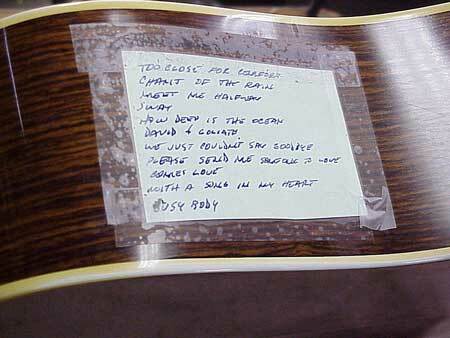 You can't play your guitar without touching it. And you can't touch it without getting it at least a little bit dirty. If you take a bit of time to do some "preventive" cleaning each time you play, you can avoid a number of future problems. In this short article, I'll deal with the easy stuff first, and proceed to more drastic cleaning and polishing as I go along. Best to avoid wiping with the printed area of T-shirts. Some of the silkscreen paints are thick enough to scratch a delicate finish. 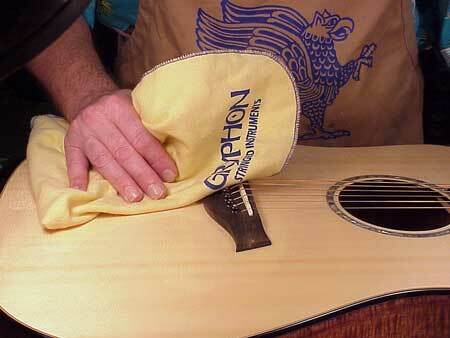 As you wipe down the entire guitar after each time you play it, you actually do a bit of polishing, too. 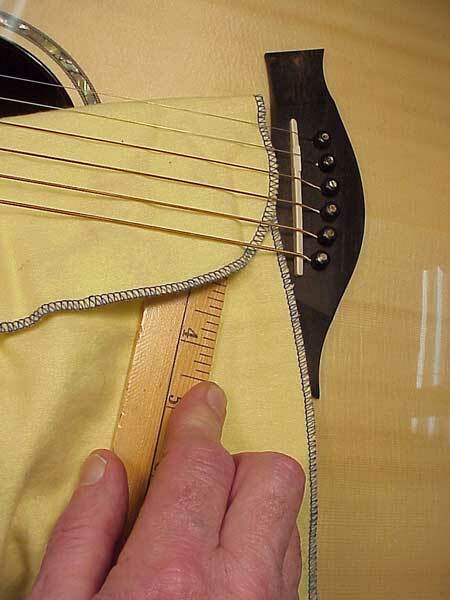 In fact, simply wiping with a cotton cloth will keep a guitar looking like new. Some areas, such as the face under the strings, may seem a bit hard to reach, but it's not that difficult if you simply shove the wiping cloth under there to take off the surface dust. 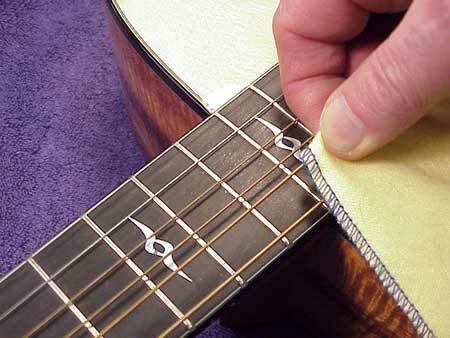 You can also keep the fingerboard relatively clean by wiping right over the board, strings and all. As you wipe down the finish, particularly on the top and back, you may notice some spots or areas that don't come perfectly clean. Fingerprints, smudges, and other dirt may respond well to a trace of moisture. "Huff" some warm breath on the surface the way you would if you were about to wipe the inside of your car's windshield. Just that little bit of condensation may be enough moisture to allow you to wipe the offending area clean. If your instrument seems to have a persistent "haze" on the surface of the finish, you'll probably need to use a lot of wiping cloths. Rewiping with a used cloth can deposit that contamination right back on the surface. So, if you're wiping down an instrument with a lot of surface haze, you'll need to keep using new cloths as you go. I've sometimes run through more than half a roll of those blue wipers doing a single guitar! 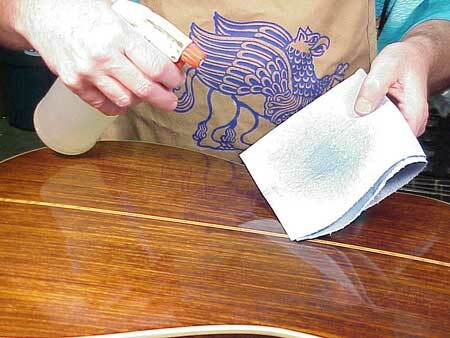 Follow the damp wiping by buffing with a dry cloth to remove any streaks. 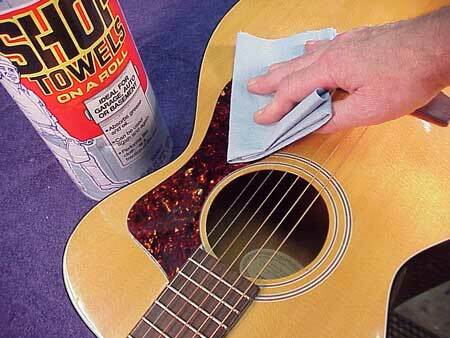 There are lots of commercial guitar polishes and cleaners on the market. They are basically of three types - water based cleaners, creamy, water based cleaners with very fine abrasives, and oils. Most of these are fine products, and, used according to directions, will give good results. Oils will remove oily smudges, but may not have any effect on water soluble dirt. Water-based cleaners (which look semitransparent in the bottle) should be sprayed on the cloth rather than on the instrument, and will clean up water soluble dirt best. 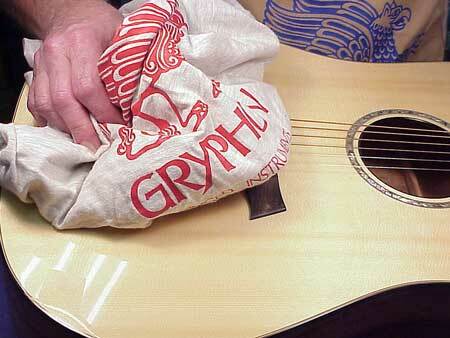 The creamy polishes may have a slight abrasive, and are best avoided if you have a "matte" or dull finished guitar. Too much polishing can cause a semi-gloss finish to become shiny in patches. Well, so much for the easy stuff! How about guitars that are old, or have more serious grunge, or damaged finishes? Some cleaning and polishing problems are best left to professionals, and some finishes are so damaged that there's nothing to be done.